Mexican troops have uncovered at least 72 bodies on a remote ranch in northeastern Mexico. 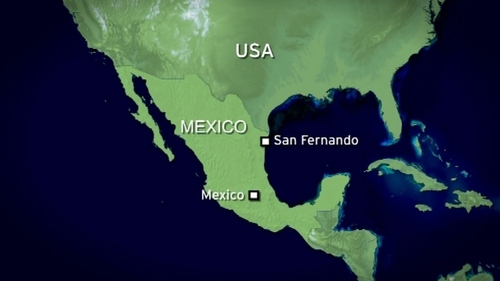 The find came after a shootout between troops and suspected drug traffickers near the town of San Fernando in Tamaulipas state, which borders Texas. A member of the military and three gunmen were killed in the incident. 'The bodies were dumped about the ranch and were not buried. We are still investigating how long they had been there,' a military spokesman said. 'The lifeless bodies of 72 people were found' after the troops went to the ranch when a man suffering from gunshot wounds approached a nearby military checkpoint and said he had been attacked on the ranch by suspected drug traffickers. The operation, which included military air support, captured one ‘underage suspect,’ but some gunmen managed to escape. The military seized 21 rifles and about 6,600 rounds of ammunition, the navy said. Mass graves have been turning up with increasing frequency in Mexico’s drug war. The violence has claimed the lives of an estimated 28,000 people since 2006, despite a military show of force in Mexican cities by the government of President Felipe Calderon. Tamaulipas has become one of Mexico's bloodiest drug flashpoint's since the start of the year as rival hitmen from the Gulf cartel and its former armed wing, the Zetas, fight over smuggling routes into the United States.